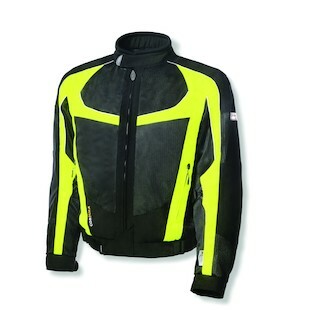 The Switchback 2 is the next evolution in technical mesh gear from Olympia, with an arsenal of features that make it a key option for warm weather riding gear. Replacing the original Switchback, the Olympia Switchback 2 Jacket gets an updated American fit and more refined aesthetic. Most noticeably, the 2 layer system now features a waterproof destination liner which can be worn either outside or inside the mesh shell. A new, modern drop tail will have sport-touring and sport riders smiling, and additional 3m Scotchlite piping will catch those headlights at night. Both the men’s and women’s Switchback 2 feature an 8” connection zipper, and will work with the entire line of Olympia pants. Ballistic mesh covers a larger portion of the jacket for increased airflow, and authentic 500D Cordura® reinforcement provides essential protection at impact areas. The Olympia Women’s Switchback 2 Jacket also features a new, more flattering hourglass cut. 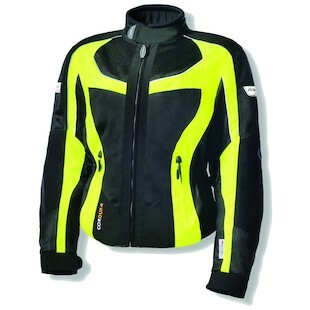 YKK zippers and Neoprene soft-touch framing in the collar give the Switchback 2 refined feel and a sense of polish. At $239, the new Switchback 2 may be one of the best values available in the world of lightweight technical mesh. Check it out, and cool off!